Welcome to another New to Me monthly Link Party. This is our chance to celebrate the trying of new activities, whether we are successful or not! My New to Me this month has been over two years in the making! It was just over two years ago that I visited an exhibition of needlework at a local church, where I discovered that the exhibits were all projects completed by participants in a weekly embroidery class. You will, no doubt, not be surprised to know that I put my name down on the waiting list for the class. After a few months without any response I naturally forget all about the list and the classes, so you can imagine my surprise earlier this month when I received a call to tell me that I was now top of the list and a place had just come vacant! After a bit of to-ing and fro-ing with information, mostly from me along the lines of "what exactly did I put my name down for again?" I set off for my first class a couple of weeks ago. Embroidery featured in my other New to Me this month, in my Christmas Ornament Card. Not only did I get a chance to practice that fly stitch for the bird tracks and my french knot for the robin, but I also used Lutradur for the first time as the base fabric for the machine embroidery. Looking forward to seeing what you have been up to this month! your patience has paid off and now you are embroidering. 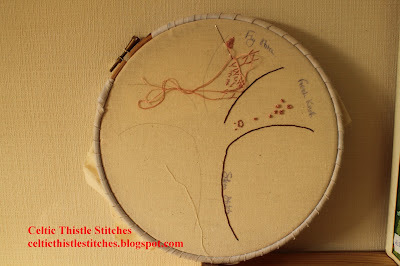 Have you seen Sharon Boggin`s site pintangle, she gives a new embroidery stitch every week with full instructions. 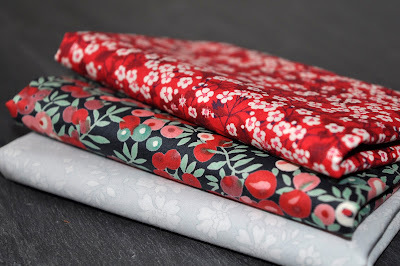 She is also about to publish a book on crazy quilting. I have got my stitch magazine out but so far not tried the lutrador, really must get my act together! A two year waiting list? Good grief! That's a long time to wait ... I love embroidery. Very cute embroidered picture but I'm going to Google Lutrador as I've not a clue what it is! 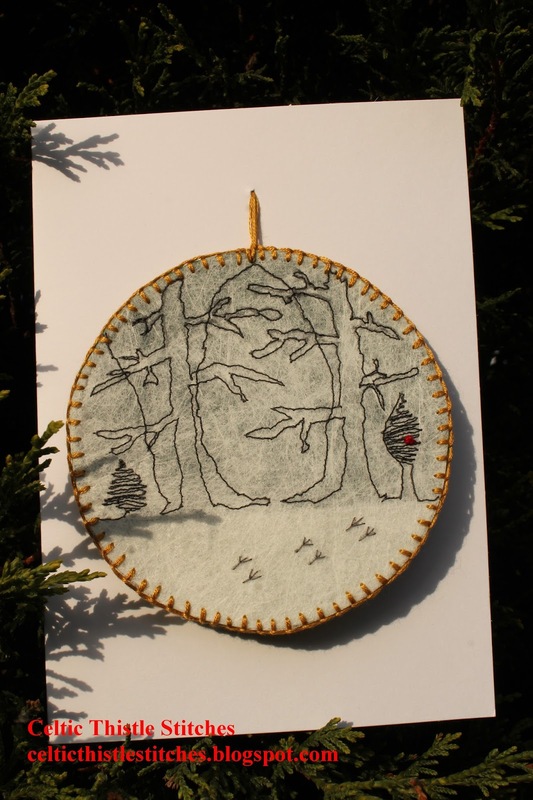 Ho, Ho, Ho and on We Sew - first card!